Wedding invitations are a key first impression for your guests, so it’s important to understand the breakdown of their key parts! Obviously, you have the invite itself, but do you know the difference between an inner and outer envelope? We’ll break down the typical invitation pieces and the information to include in each part so that the invitation process is as smooth as possible and your guests have all the information they need! This is the one part you won’t forget! The invite will include information as to who is hosting and the name of the bride and groom. It will also include the day, time, and location of your wedding as well as the style of the day. It’s important to let guests know the attire (or a theme if you have one) if you’re having a more formal wedding so they may make the proper preparations beforehand. This card is a great way to include all the extra need to know info! You can include registry information, your wedding website, directions, and the reception location if it happens to be different than your ceremony location. You can call it a Accomodations card and have hotel block information if you've got a lot of out of town guests. If you need both, no problem! You're welcome to have as many details cards as you would like. It's better to convey all the necessary info to your guests in a easy to read, easy to find fashion. Typical wedding invitation etiquette says you should refer to each of your guests by title, first, and last names. No abbreviations or middle initials should be used on the outer envelope as well (e.g. "Street" not "St."). If you are addressing the envelope to two unmarried people who reside together, you write both names in full and connect them by "and." If the family is close, you may also address them with familiar names, such as Aunt Mary and Uncle Peter. 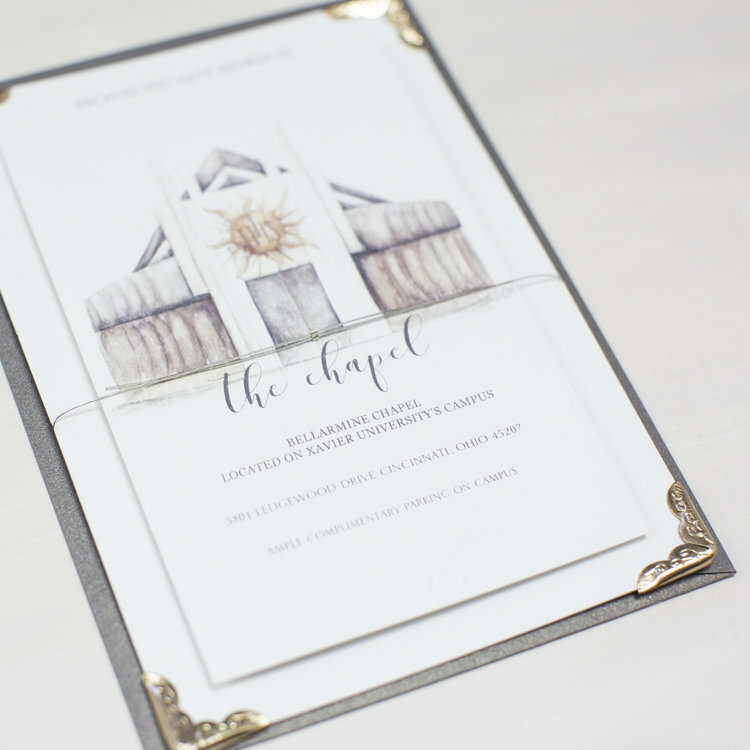 Although inner envelopes are traditional to use, many couples are electing to use a belly band or something similar to hold the components of the invitation together instead. If you choose an alternative to the inner envelope, make sure you are specific on your outer envelope as to who you are inviting to avoid any confusion. In this case, the children would be specified on the outer envelope as well! This is the envelope guests will use to return their RSVP card to you. You’ll want to make sure to pre-address and pre-stamp this envelope to make it as easy peasy lemon squeezy for your guests! All they will have to do is check off or fill in some info and drop it in the mailbox. Plus, the simpler this is, the faster you’ll receive it to start checking off your to-do list. Since every invitation suite weighs a different amount depending on the design, you want to make sure to have one completely made up as a sample. Then, take it to the post office to get weighed. Afte this, you will buy the necessary stamps! Sometimes it's two forever stamps, sometimes it's a few 2, 10, or 20 cent stamps you'll need to add. This is a great opportunity to add another design element and even have your stamps custom made! Recently the post office released a new super cute floral LOVE stamp where you can use a collection of them on your envelope. Even with all of the components of a wedding invitation, it's much simpler to put together when you're working with someone else and can ask them questions. If you want to inquire about wedding invitation design or have questions regarding your invitations, OKOTA would love o hear from you! Top 10 Tricks to Staying Cool on Your Wedding Day! What Does a Day of Coordinator Really Do? What do Wedding Flowers Really Cost?